11/26/07, The Dakota: I had heard that Roy Hargrove's current quintet was Hargrove on trumpet and flugelhorn, Ronnie Matthews on piano, Justin Robinson on alto sax, D'Wayne Bruno on bass, and Willie Jones III on drums. He showed up at the Dakota with Gerald Clayton on piano, Robinson on alto sax, Danton Boller on bass, and Montez Coleman on drums. Nobody minded. This is the same quintet he played with earlier this year in Port Townsend, Washington, at their summer jazz festival, so maybe it's the actual current quintet? My most pressing question going into the evening was not about personnel but hair. Would Roy's dreads be short or long? They were gone. He's wearing braids these days, cornrows. For his first night at the Dakota, they were tucked under a homburg hat with a feather. He also wore a pinstriped suit, an impeccably folded white pocket square, a red tie, and a diamond stud in his ear. It's good to see a jazz musician dress up for the occasion. Put Roy and James Carter on the same stage and it's GQ-worthy. Sartorially and musically, Hargrove never disappoints. A friend who saw both sets on Tuesday called it "one of the best shows of the year." At the last set on Monday, we heard hard bop and tender ballads, searing high notes from the trumpet and velvet from the flugelhorn, witty call-and-response between Hargrove and Robinson, and gorgeous piano playing from 23-year-old Clayton. I think we also heard some RH factor funk/soul. I wish I'd been in NYC four days later, on 11/30, when Hargrove and his 19-piece big band played with Q-TIP at the Harlem Stage. Gerald Clayton is the son of bassist John Clayton, co-leader of the Clayton Hamilton Jazz Orchestra (with saxophonist Jeff Clayton and drummer Jeff Hamilton). In 2006, he came in second in the Thelonious Monk Institute Jazz Piano Competition. He plays on several tracks on Diane Krall's most recent recording, From This Moment On. You can hear quite a lot of Clayton on his Web site. Music will start to play when you land on his home page, and if you click on MUSIC in the menu bar at the top of any page, then click on the word "recordings" when it appears right below it, you'll get to a page with an interview and tracks from a KJAZZ broadcast. 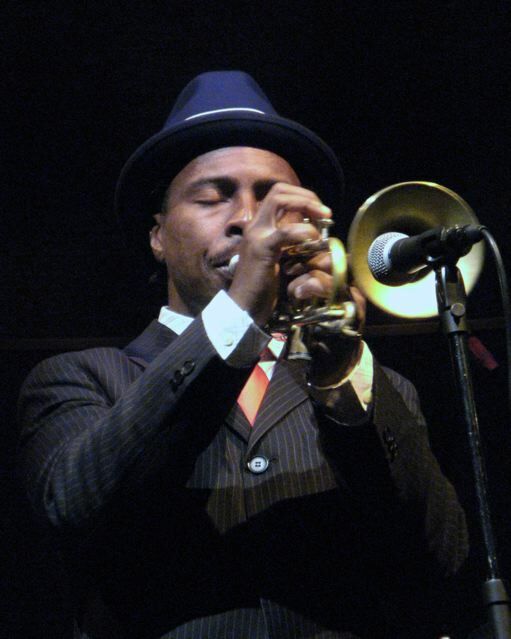 Photo of Roy Hargrove by John Whiting. This is the current Roy Hargrove Quintet and has been for quite a while. Danton Boller is the most recent addition of the past year. Thanks for the clarification. I've seen Roy play with a number of different configurations over the years, and the information I had before he showed up most recently was the older quintet. I had the sheer joy and pleasure of being the driver for the Roy Hargrove Quintet's for four days when they came to the Centrum/Port Townsend Jazz Festival. I got to hear a little about Roy's different band configurations throughout his career. I then enjoyed being at all four nights of the Jazz Alley (Seattle) performances when they returned two weeks later. A great group of guys -- fun and friendly. I first met Roy by introducing him and his then quintet at the Lionel Hampton Jazz Festival, Feb. 2006. His two most recent simultaneously released (May 2006) recordings are Nothing Serious (the quintet) and Distractions (RH Factor). Lucky you! We usually say hi to Roy when he comes to the Dakota; his cousin is a manager at the club and a friend of ours. We do the occasional drive-the-artists thing if they want to go somewhere after a show. Our favorite passengers to date: James Carter and Cyrus Chestnut...I think James plays his horn in his sleep.